Procopius, born at Caesarea in Palestine late in the 5th century, became a lawyer. In 527 CE he was made legal adviser and secretary of Belisarius, commander against the Persians, and went with Belisarius again in 533 against the Vandals and in 535 against the Ostrogoths. Sometime after 540 he returned to Constantinople. He may have been that Procopius who was prefect of Constantinople in 562, but the date of his death (after 558) is unknown. 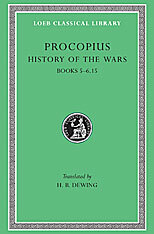 Procopius’s History of the Wars in 8 books (here collected in five volumes) recounts the Persian Wars of emperors Justinus and Justinian down to 550 (2 books); the Vandalic War and after-events in Africa 532–546 (2 books); the Gothic War against the Ostrogoths in Sicily and Italy 536–552 (3 books); and a sketch of events to 554 (1 book). The whole consists largely of military history, with much information about peoples and places as well, and about special events. He was a diligent, careful, judicious narrator of facts and developments and shows good powers of description. He is just to the empire’s enemies and boldly criticises emperor Justinian. Other works by Procopius are the Anecdota or Secret History—vehement attacks on Justinian, Theodora, and others; and On Buildings (or The Buildings of Justinian) which describes (to 558 CE) roads and bridges as well as churches, forts, hospitals, and so on in various parts of the empire. 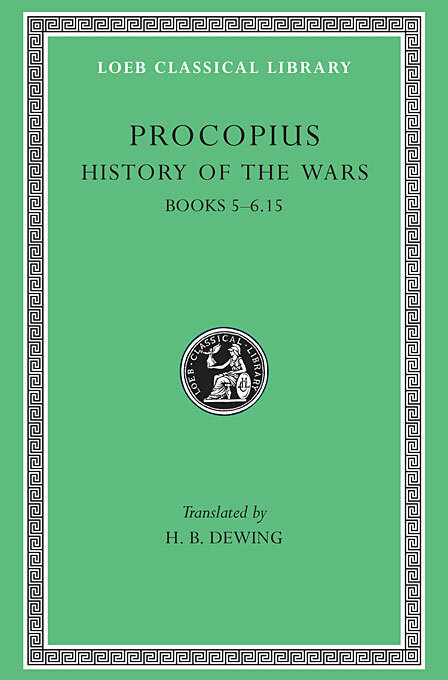 The Loeb Classical Library edition of Procopius is in seven volumes.